Examples, videos, stories, and songs to teach Grade 3 students about mixed numbers. The following diagram. gives an example of a mixed number. 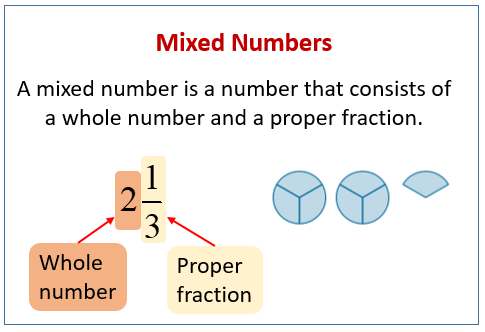 A mixed number is a number that consists of a whole number and a proper fraction. Scroll down the page for more examples and solutions. How to convert between mixed numbers and improper fractions?